One of the main goals of the Chesbrough/Vanhaverbeke/West 2006 book was to shape the research agenda of the open innovation. Our final chapter was immodestly entitled “Open innovation: a research agenda” (West, Vanhaverbeke and Chesbrough, 2006). According to Google it has 189 cites — not the most influential chapter in the book (which is Chesbrough, 2006) — nor as well cited as key lit reviews (e.g. Dahlander & Gann, 2010), but still not bad for a book chapter. This year, there have been several other articles that claim to summarize the current literature and suggest topics for future research. Yes, some of these are my articles, but I think together I think they provide the best summary of OI research opportunities today. Since I'm trying to write a short encyclopedia article on open innovation — and want to make it different from my 2011 article — it seemed a good time to review what’s been written recently. It helps that several of these articles are associated with large new batches of OI research (i.e. the June 2014 special issue of Research Policy and the forthcoming New Frontiers in Open Innovation), and thus are directly tied to some of the latest work. The fact that almost all OI research is about the inbound process, with very little about the outbound process (Figure 2). Just for fun, in Figure 1.3 they offer a word cloud form the abstracts of nearly 1,000 articles, chapters and proceedings papers taken from SSCI for 2003-2012.
we define open innovation as a distributed innovation process based on purposively managed knowledge flows across organizational boundaries, using pecuniary and non-pecuniary mechanisms in line with the organization’s business model. This is the introductory article for the nine peer-reviewed articles of the special issue. The discussion of trends was first drafted by Salter and West (utilizing time spent over breakfast in Bath a year ago). The papers in this SI reflect three emerging themes in open innovation research. The first is newer and better approaches to measuring open innovation. The second is a more sophisticated (and nuanced) understanding of the role of appropriability in enabling open innovation. The third comprises efforts to more closely integrate open innovation with established theories of management and economics. Here we review these three themes, and three others that (while not represented in the special issue) will also shape the conception of open innovation in its second decade: coupled innovation, nonpecuniary motivations and multi-level analysis. The measurement issue seems pretty self explanatory: it’s important trend but one that is both expected and easily understood for a new body of work. The opening article of the entire special issue by Dahlander and Piezunka (2014) — both the first article finished and one of the strongest throughout the process — looks at external knowledge sourcing with a massive database that circumvents previous sampling bias problems. Appropriability is a longstanding topic in OI, going back to the 2006 book (West, 2006) if not before; the special issue includes not only the expected article by Henkel and colleagues (2014) on the topic, but a new article by the dynamic duo of OI econometrics, Laursen & Salter (2014). The questions of established theories and levels of analysis come up again, so I’ll discuss them separately below. The topic of coupled OI is near and dear to my heart — my major research emphasis today — but because I talked about it a few months ago (in the context of the Piller and West 2014 book chapter), I’ll save that for another time. The nonpecuniary motivations is a helpful extension that Dahlander & Gann (2010) used to distinguish forms of OI that are motivated by profit (or greed) and those that are not. They (looking back) summarize how research has considered the motivations of organizational actors for a given knowledge flow. In the new book Chesbrough & Di Minin (2014) extend this to its logical conclusion: how does OI apply to government and other non-profit organizations? Their discussion of “open social innovation” fills an important gap in OI research. we discuss the need to connect (and integrate) open innovation research into mainstream management theories. we look for possible extensions of open innovation research into new application fields, such as SMEs, low-tech firms, and non-profit organizations. Open innovation also has several implications for public policy and multinational companies. we elaborate on the need to examine open innovation at different levels of analysis. we identify the need to develop frameworks to understand how companies must change internally to successfully apply open innovation. we highlight how open innovation has implications for functions beyond R&D that have not traditionally been involved in implementing open innovation: such as HRM, PR, and legal. The first and third items are discussed below. The second was a natural theme for the book and the summary, since there was a conscious effort to solicit chapters about SMEs, MNCs and nonprofits. The issue of organizational change needed to support open innovation is a longstanding puzzle in OI research. It’s a topic most closely associate with the various studies of Tim Minshall and Letizia Mortara of the University of Cambridge (and UK Innovation Research Centre), who penned an update on their research (Mortara & Minshall, 2014) for the book. Finally, the question of OI outside R&D was a real head-scratcher for me when Vanhaverbeke first suggested it. However, in straining to find enough articles to mention in this section, he convinced me this is a real gap — and thus an opportunity —for OI researchers. (Unfortunately, I didn’t catch that this was an obsolete list, since for more than five years we’ve known that community is an important level of analysis distinct from networks and industries). More recently, the work of Vanhaverbeke not only points to the importance of understanding differences within a firm on how the firm uses open innovation, but identified the level of the R&D project as an important way to operationalize that variation. They did a series of studies (Du et al 2014; Vanhaverbeke et al 2014b) in a large “European” multinational. Since institutions can exist at many levels, my own impression is that they don’t count as a separate level of analysis: most of what we call “institutions” govern at the industry or national level, with some institutionalized governance acting upon networks and communities. Both of the summary articles (West, Salter, Vanhaverbeke & Chesbrough, 2014; Vanhaverbeke, Chesbrough, West, 2014) note the importance of linking OI to mainstream theories. Although I’m a co-author on both articles, it’s fair to say that the discussions on this trend more closely match the view of Salter and Vanhaverbeke, respectively. Although the original Open Innovation book drew on deep currents of research in the broader traditions of management and economics, it did not itself seek to directly align to existing under- pinning theories in these fields. 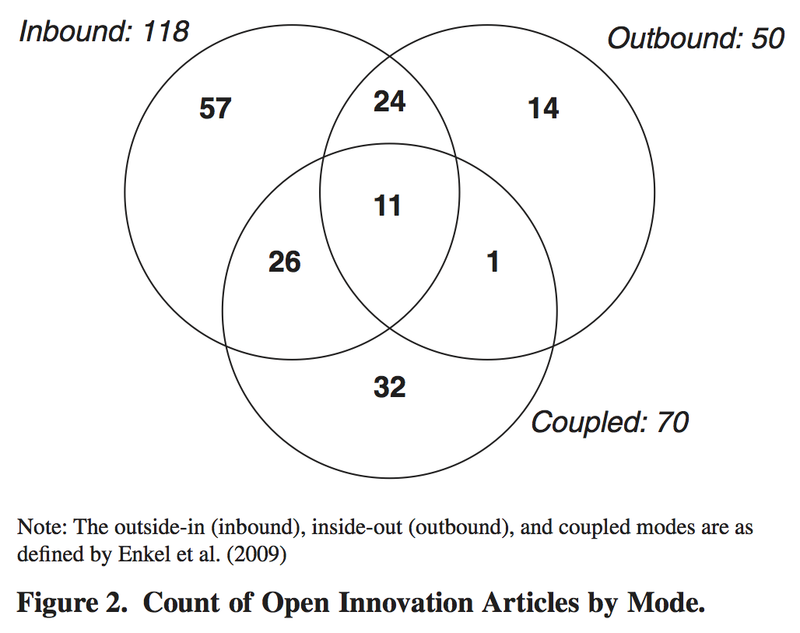 Over the past 10 years, researchers have sought to find mapping of concepts of open innovation to more general theories about the nature of the firm and its boundaries (Vanhaverbeke and Cloodt, 2014). concluding with a nod to a think piece (in New Frontiers) that links OI to theories of the firm. It then points to three articles in the special issue: one on diversification via OI (Colombo et al, 2014), one a model of property rights and OI (Gambardella & Panico, 2014), and one that applies the level of the project to classify OI (Felin & Zenger, 2014). The open innovation literature originated with reflections on observations about changing innovation management practices in companies (Chesbrough, 2003a, 2006a). Literature about open innovation has grown rapidly, and there is a growing need to relate or integrate it into existing innovation management research. Other than the aforementioned Vanhaverbeke and Cloodt (2014), I don’t think anyone has attempted to link OI to the “traditions,” but clearly in both articles (and other recent articles) there have been efforts to link and contrast to specific areas of management research. To me, the flurry of recent work demonstrates two things about open innovation. First, OI remains an active and vibrant area of research. Second, it is one that is far more mature and established than it was when we completed our first academic book in 2006, as reflected by trends such as measurement and increasing linkages to established theory in management and economics. I'm hoping this posting will help new (and existing) OI researchers come up with ideas for future research opportunities. However, it’s just a blog posting: please see the original articles for more specifics. Chesbrough, Henry (2006). “Open Innovation: A New Paradigm for Understanding Industrial Innovation,” in Henry Chesbrough, Wim Vanhaverbeke, and Joel West (Eds. ), Open Innovation: Researching a New Paradigm, Oxford: Oxford University Press, 1-12. Chesbrough, Henry and Marcel Bogers (2014). “Explicating Open Innovation: Clarifying an Emerging Paradigm for Understanding Innovation.” In Henry Chesbrough, Wim Vanhaverbeke and Joel West (Eds. ), New Frontiers in Open Innovation, Oxford: Oxford University Press, pp. 3-28. Chesbrough, Henry and Alberto Di Minin (2014). “Open Social Innovation.” In Henry Chesbrough, Wim Vanhaverbeke and Joel West (Eds. ), New Frontiers in Open Innovation, Oxford: Oxford University Press, pp. 169-188. Mortara, Letizia and Tim Minshall (2014). “Patterns of Implementation of OI in MNCs.” In Henry Chesbrough, Wim Vanhaverbeke and Joel West (Eds. ), New Frontiers in Open Innovation, Oxford: Oxford University Press, pp. 242-255. Open Innovation.” In Henry Chesbrough, Wim Vanhaverbeke and Joel West (Eds. ), New Frontiers in Open Innovation, Oxford: Oxford University Press, pp. 29-49. Vanhaverbeke, Wim, Henry Chesbrough and Joel West (2014). “Surfing the New Wave of Open Innovation Research.” In Henry Chesbrough, Wim Vanhaverbeke and Joel West (Eds. ), New Frontiers in Open Innovation, Oxford: Oxford University Press, pp. 281-294. Vanhaverbeke, Wim and Myriam Cloodt (2014). “Theories of the Firm and Open Innovation.” In Henry Chesbrough, Wim Vanhaverbeke and Joel West (Eds. ), New Frontiers in Open Innovation, Oxford: Oxford University Press, pp. 256-278. Vanhaverbeke, Wim, Jingshu Du, Bart Leten, and Ferrie Aalders (2014). “Exploring Open Innovation at the Level of R&D Projects.” In Henry Chesbrough, Wim Vanhaverbeke and Joel West (Eds. ), New Frontiers in Open Innovation, Oxford: Oxford University Press, pp. 115-131. West, Joel (2006). “Does appropriability enable or retard open innovation,” In: Chesbrough, Henry, Wim Vanhaverbeke, and Joel West, eds. Open Innovation: Researching a New Paradigm, Oxford: Oxford University Press, pp. 109-133. West, Joel, Vanhaverbeke, Wim and Chesbrough, Henry (2006), “Open Innovation: A Research Agenda,” in Henry Chesbrough, Wim Vanhaverbeke, and Joel West (Eds. ), Open Innovation: Researching a New Paradigm, Oxford: Oxford University Press, pp. 285-307. Oxford reports that New Frontiers in Open Innovation “is available for pre-orders and will ship on 16 November 2014.” It’s also available for pre-order from Amazon and Amazon UK. I've put together a few web pages with information about the book. This links to the pre-print chapters at Exnovate.nl (maintained by co-editor Wim Vanhaverbeke), and includes the biographies of the contributors. I also hope to have a chance soon to post the full references from the book, to go with the references from the 2006 book. Asakawa, Kazuhiro, Jaeyong Song, and Sang-Ji Kim (2014). “Open Innovation in Multinational Corporations: New Insights from the Global R&D Research Stream.” In Henry Chesbrough, Wim Vanhaverbeke and Joel West (Eds. ), New Frontiers in Open Innovation, Oxford: Oxford University Press, pp. 157-168. Brunswicker, Sabine and Vareska van de Vrande (2014). “Exploring Open Innovation in Small and Medium-Sized Enterprises.” In Henry Chesbrough, Wim Vanhaverbeke and Joel West (Eds. ), New Frontiers in Open Innovation, Oxford: Oxford University Press, pp. 135-156. Chesbrough, Henry and Roya Ghafele (2014). “Open Innovation and Intellectual Property: A Two-Sided Market Perspective.” In Henry Chesbrough, Wim Vanhaverbeke and Joel West (Eds. ), New Frontiers in Open Innovation, Oxford: Oxford University Press, pp. 191-207. Ventures.” In Henry Chesbrough, Wim Vanhaverbeke and Joel West (Eds. ), New Frontiers in Open Innovation, Oxford: Oxford University Press, pp. 208-222.
of Business Convergence.” In Henry Chesbrough, Wim Vanhaverbeke and Joel West (Eds. ), New Frontiers in Open Innovation, Oxford: Oxford University Press, pp. 94-114. Increase Value in External Knowledge Searches?” In Henry Chesbrough, Wim Vanhaverbeke and Joel West (Eds. ), New Frontiers in Open Innovation, Oxford: Oxford University Press, pp. 241-257. Vanhaverbeke, Wim and Henry Chesbrough (2014). “A Classification of Open Innovation and Open Business Models.” In Henry Chesbrough, Wim Vanhaverbeke and Joel West (Eds. ), New Frontiers in Open Innovation, Oxford: Oxford University Press, pp. 50-68. Vanhaverbeke, Wim, Jingshu Du, Bart Leten, and Ferrie Aalders, (2014). “Exploring Open Innovation at the Level of R&D Projects.” In Henry Chesbrough, Wim Vanhaverbeke and Joel West (Eds. ), New Frontiers in Open Innovation, Oxford: Oxford University Press, pp. 115-131. West, Joel (2014). “Challenges of Funding Open Innovation Platforms: Lessons From Symbian Ltd.” In Henry Chesbrough, Wim Vanhaverbeke and Joel West (Eds. ), New Frontiers in Open Innovation, Oxford: Oxford University Press, pp. 71-93. Nov. 15 is the new deadline for the Information Systems Research special issue on “Collaboration and Value Creation in Online Communities”. The deadline has been extended from the original Nov. 1 date, according to an email I received this morning from Georg von Krogh (who is editing the special issue with Samer Faraj, Karim Lakhani and Eric Monteiro). I blogged on the original CFP in February. I don’t personally have anything ready for the call, but look forward to see the articles when it the special issue is published in 2016. (In)famous OI scholar moving on to next career? Prof. Dr. Lichtenthaler informed the Rector of the University of Mannheim that he wants to leave the University of Mannheim on March 31, 2015. The state of Baden – Württemberg has agreed with his wishes. That’s not an excerpt from the press release — it’s the entire press release. Due to his problems with self-plagiarism and questionable statistical results, Licthenthaler has 16 retracted papers plus three that were withdrawn after acceptance but prior to online publication. Six (plus three) of these papers were co-authored by Holger Ernst, who remains a faculty member at WHU (where Lichtenthaler completed his PhD and since-cancelled habilitation). It seems unlikely he will get another position in a German university. People who’ve met Lichtenthaler speculate that he will be leaving academia for another career. Since journals don’t publish a notice of non-retraction, it’s not clear whether any of more than 20 non-retracted articles are still being considered for retraction. Perhaps his citations will go up if people conclude there’s no risk of further retractions. Sadly (for more conventional scholars), his most cited article is his 2009 AMJ article that was retracted last December. Google Scholar says 74 articles and working papers that cite the retracted AMJ article been published since it was retracted.